Air purifiers are wonderful and can definitely improve your quality of life. Unfortunately products sold today on the market aren’t always easy to figure out. To make matters worse, as a new buyer it’s easy to be mislead into buying a product that is misrepresented and pretends to be just as good as better-quality products. We’ll compare HEPA type vs HEPA filters in great detail and explain the differences. There’s lots to learn so read on to find out more. 5. 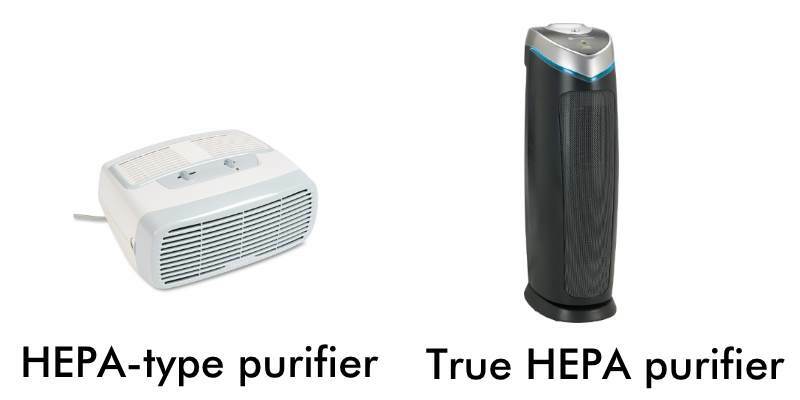 Are HEPA type purifiers bad? Are there exceptions? Shown: 2 very common air purifiers, which don’t appear very different from the outside. Left: A Holmes HAP242-NUC air purifier which includes a HEPA-type filter and marketed similarly to a true HEPA filter. Right: GermGuardian AC4825 air purifier. It includes a HEPA filter which meets the High Efficiency Particulate Air (HEPA) standard. The problem with air purifiers sold today (as pictured above, for example) is that it’s very easy to think they’re all the same. Because of clever marketing you may think a HEPA-type is just as effective as a true HEPA product. The problem lies in the details and how filters are rated. A High Efficiency Particulate Air (HEPA) filter describes a type of filter designed to meet efficiency and air purification quality levels set by the United States Department of Energy. These filters are made of a very dense fiber-like material. To meet the standard a filter must be able to remove 99.97% of airborne particles that enter it down to 0.3 microns in size. A micron, or micrometer (uM), is 1/1,000,000 of a meter. It’s a common unit of measurement for microscopic elements. 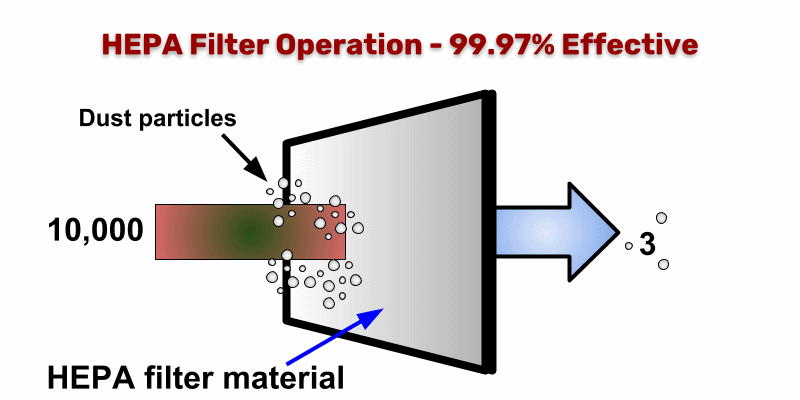 A filter’s efficiency refers how many particles it can trap and remove from the airflow that passes through it. At 99.97%, for every 10,000 particles flowing into it only about 3 escape. 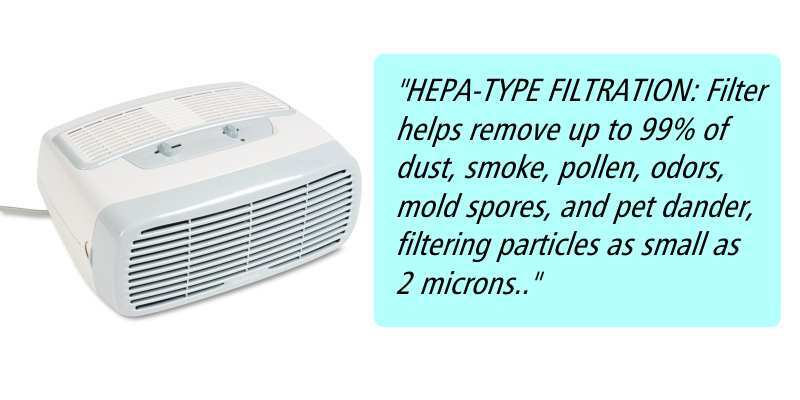 HEPA filters are very effective at cleaning air! The good news is that because the High Efficiency Particulate Air (HEPA) standard exists when selecting a product you can be absolutely sure of its performance. This graph shows how typical air purifiers like HEPA filters perform. 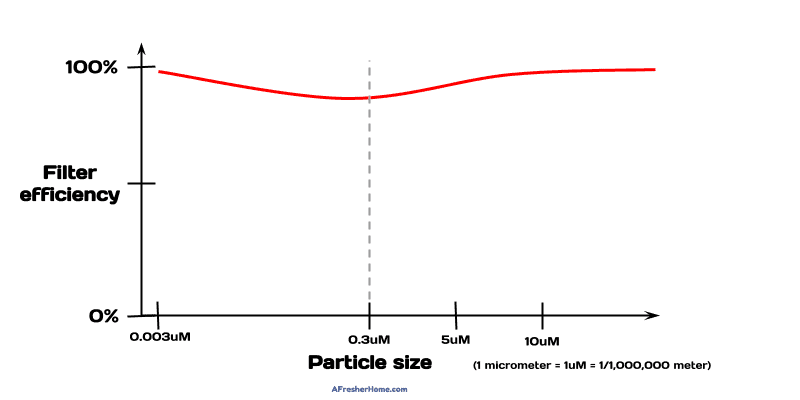 A HEPA filter’s efficiency actually begins to fall for particles near the size of 0.3uM, which is why they’re rated to “99.97% of particles down to 0.3uM.” Filters actually work even better above that size (as seen in the graph, like 5uM for example). Following the red line on the graph you can see that the efficiency (the amount of particles it can capture) drops a bit near a certain size range. The interesting thing to know is that filters actually trap more particles below that size range, but it’s misleading to sell a filter based on that. The minimum particle size it works well at is the most important thing to know. In the case of a genuine (true) HEPA filter you can be sure that’s 0.3uM. “HEPA-type” filters are those that look similar to true HEPA filters but don’t meet the same requirements. They are not standardized and can have any range of efficiency and minimum particle size cleaning. HEPA-type purifiers are sold to give buyer the impression they’re getting the same performance when in fact who knows? Unless its specifically made clear, it’s anybody’s guess. There’s no requirement for companies selling those to have demonstrated performance. An example Clean Air Delivery Rate (CADR) label from the Honeywell HPA160 medium-large room air purifier. CADR ratings are lab-verified cleaning efficiency ratings based on measuring how effective an air purifier is for 3 major types of air contaminants. The industry standard Clean Air Delivery Rate (CADR) is a standardized test carried out by the Association of Home Appliance Manufacturers (AHAM). The AHAM is an independent (non-government) voluntary industry association which was established to better rate and standarize the expectations of many appliances you buy. Air purifiers have unique requirements as well so a method of testing their cleaning effectiveness was developed. Using the CADR you can better shop by comparison for those models which include the rating in their specifications. The CADR rating is a cleaning effectiveness rating. 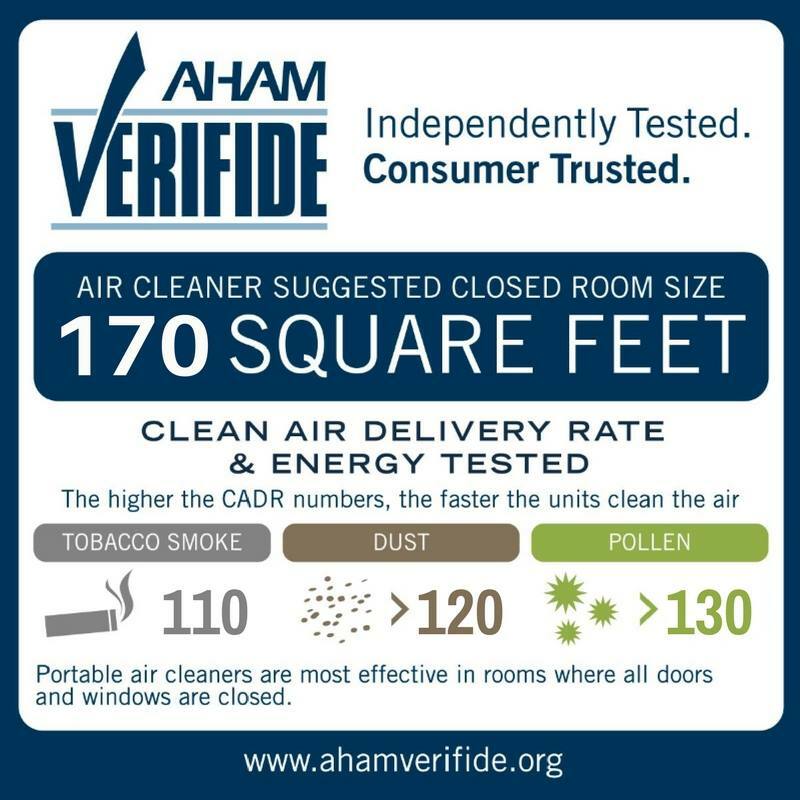 It’s a score based on standard lab tests by the AHAM in which a purifier is placed in a room with a measured amount of air contaminants. The air purifier is then observed and measured based on how well and fast it can clean the 3 types of contaminants (smoke, dust, and pollen) in a given amount of time. Air purifiers with a higher air flow rate (larger purifiers with more fan speed) will nearly always rate higher. That’s expected. Therefore when shopping and reading CADR ratings you should compare purifiers of a similar recommended room size. (For example, a small room purifier will have a lower CADR rating than a large room one, so comparing them as equals doesn’t make sense). 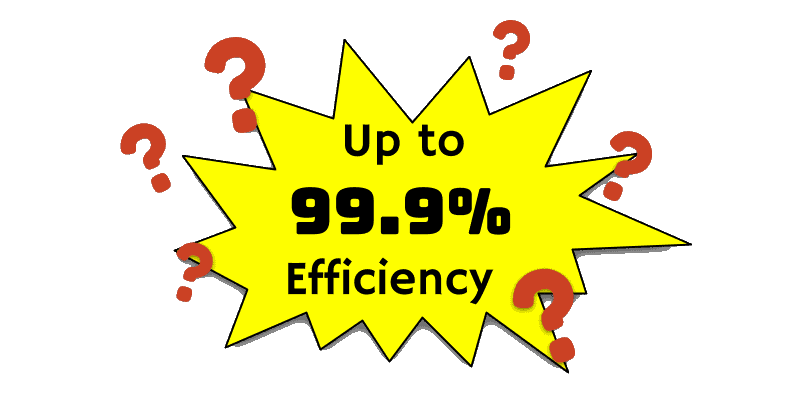 You might find products advertised as having “99.9% efficiency” or something like that. But the most important thing is what’s the minimum particle size they can filter at that level? What is it? How does it really perform? Unless it’s specifically made clear, you have no idea how well it’s actually going to perform. More than likely it’s not close to the performance of a true HEPA filter and is a bad choice. In some cases HEPA-type filters can allow allergens, dust mite particles, and more to escape! That’s because some of the most common airborne particles that give people problems are smaller than they can capture. Image showing the filters from the previously shown examples. 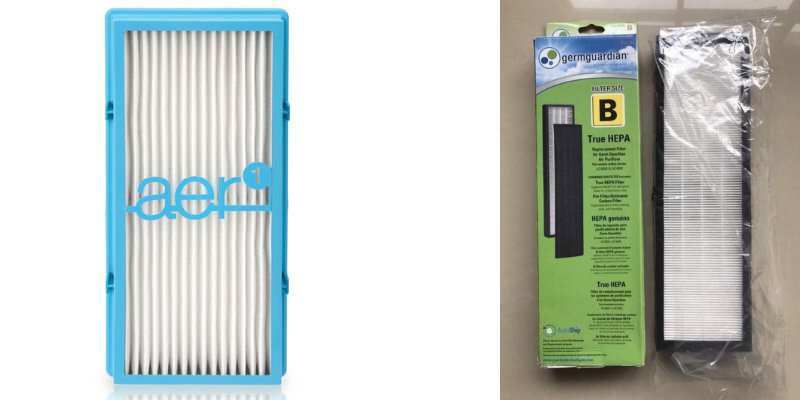 A HEPA-type filter (Holmes air purifier, left) and a true HEPA filter (GermGuardian, right) look extremely similar. In most cases you won’t be able to visually tell the differences. You’ll need to be very careful and look for specifications that tell you their performance. However in my opinion “HEPA-type” filters are best avoided and you should simply get the real thing. Avoid unknown HEPA-type filters. Don’t waste your money. Are HEPA type purifiers bad? Are there exceptions? As I mentioned earlier, it’s generally best to avoid HEPA-type purifiers. But there are exceptions to the rule. 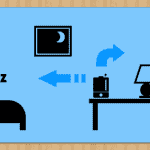 The Holmes desktop air purifier I showed earlier is an example I can use. It’s it’s more of a budget model. However, in this case, Holmes does specify it can trap contaminants down to 2 microns (2uM) in size. While that’s poor in comparison to a real HEPA filter, it’s still ok for some purposes. For example, for larger particles like dust mites, household dust, hair, and so forth it can work just fine. In that case you’ll have to be well-informed about what size particles your air problems include. I definitely wouldn’t recommend a HEPA-type filter for smoke, airborne microbes, and other issues. 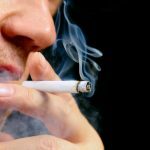 Smoke particles have been shown to measure well below 1 micron in size. Honestly, this kind of information is not for the average person and leaves too much room for making a bad buying decision in my opinion. If you’re on a tight budget and your air problems aren’t demanding they’re an option to consider. However, a better purifier with a real HEPA and carbon filter can be bought for around $50 these days. As they look very similar to each other, you can’t rely on your eyes alone. As I mentioned earlier, because of clever marketing you may be mislead to think HEPA-type purifiers are just as good as the real thing. “HEPA-type” filters are not standardized and cannot match the performance of true HEPA purifiers. Often they don’t disclose the minimum particle size they can work well for. This means they’re not a good choice generally but in some cases they’re ok to use. True HEPA purifiers are verified to meet demonstrated performance. They’re standardized and must meet the 99.9% efficiency / 0.3uM particle size quality standard. In my opinion it’s worth spending a little bit more money for a product with better air cleaning ability and that has demonstrated effectiveness. Speaking of money – got a budget? I’ve got a great list of some of the best air purifiers under $100 here. One of the best (and that I personally own) is the super-popular GermGuardian AC4825 I reviewed in great detail here. The best air purifiers for smoke - 5 of the best you can buy! Yet still, to your helpful , it will be very helpful to know just who maintains and monitors these “true HEPA” vs. “HEPA type” claims and such. Is there any respected independent lab that actually tests these claims? (say, like UL?) Or are we left totally at the mercy of profit-driven corporations to do what’s right/honest ? As such, wouldn’t their be a vested interest on the part of the good companies to have monitored, independently derived standards and certification? Hello there and thanks for commenting. I’m glad you find my post helpful. Regarding the “sales pitch”, I’m not actually selling anything, but I do earn a tiny commission if someone purchases one of the products. This helps with the costs required to build and support my site. However, my goal isn’t getting people to buy anything. I want to help others make the best decision with their hard-earned money and have the same improved air quality that I am enjoying. I also enjoy helping others find answers to their questions as well. I’ve updated the information and added a section about one industry test (CADR) that’s standardized and can be used to verify manufacturer claims. I’ll also be digging deeper to get more details about the HEPA standard as I go.